It’s just one of those songs where everything came together at once – the beat, the words, the guitar parts, the guitar sounds, the bass, the sing speak delivery, the attitude, the look. It was a hit – except only America seemed to notice, the song reaching No.38 in the mainstream chart. It was another case of a band that were quintessentially English, appealing to Americans rather than the British – the song failed to chart in England. Although the Madness single Our House did chart in England, the topically and typically English song was also their biggest American hit – go figure. On the other hand, The Jam didn’t translate, but Morrissey does? Sometimes the culture intrigues the listener and sometimes it confuses. It also works in reverse, take The Walker Brothers or Blondie. The Godfathers were formed by ex Sid Presley Experience brothers Peter Coyne (vocal) and Chris Coyne (bass), augmented by striking blonde drummer, the well dressed George Mazur with Kris Collimore and Mike Gibson on guitars. 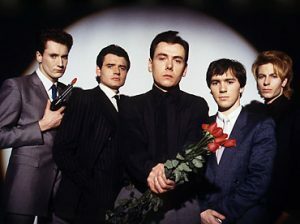 Those Orange amps, that thick deep snare drum roll and British sneer looking like The Krays in their suits interspersed with leather jackets as they move back and forth in opposite dress throughout the video from gang to gangsters. Then there’s the message in the lyrics, the reality, the truth, the despair at what life offers. How could this have not been a hit in England? A cross between Pete Townshend, Morrissey and Johnny Rotten with an overt desperate plea in the wake of social reality, growing up in a place with no future, in a place where choices are drugs or monotony. In essence it’s a suicide note. The band have recently released a new album, but only singer Peter Coyne remains. In the eighties they might have sounded too down to earth, too Pub Rock, to traditional Rock ‘n’ Roll, too Bluesy, too obvious, swinging between the Sixties legacy of authentic musical heroes and Punk’s ethos of anti heroes. Ten years earlier they might have fitted in more easily, contemporaneous to Dr Feelgood, Ducks Deluxe, Johnny G and Chris Spedding or even America’s George Thorogood and Ireland’s Rory Gallagher. Whatever your poison, whoever inspires your admiration, your support, whoever it is that makes you follow an artist that you like, you have to admit that now and again something comes along that isn’t really your bag, but still leaves you with the thought “That’s not my thing, but I really really like it”.